We offer a handicraft item, which is a perfect blend of beauty and utility in the form of Marble Mobile Stand. Carved from special White Marble Stone, the Marble Mobile Stand is designed to accommodate mobile phones of large to small sizes. Adorned with floral motif, the Marble Mobile Stand has won the appreciation of the clients from different corners of the globe. Why our Marble Mobile Stand? 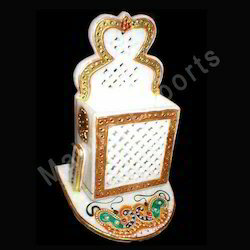 Marble Mobile Stand offered are made available by us under item number MEP145 and are in 4 inch height. Featuring beautiful as well as exclusive crafted finish, these deliver optimum utility value in safekeeping of mobile phones of different sizes. 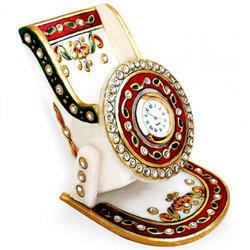 Carved from special white marble stone, these come with intricately painted and crafted surface decorations including floral motifs that help in further enhancing the overall finish of these mobile stands. Marble Mobile Stand offered are made available by us under item number MEP145 and are in 4 inch height. These marble mobile stands can accommodate mobile phones of different sizes and come with floral motifs and other decorations done on its surface. Featuring beautiful as well as exclusive crafted finish, these deliver optimum utility value in safekeeping of mobile phones of different sizes, these are perfect blend of beauty as well as utility and are made available in quality white marble finish that assists in enhancing its overall finish values. Marble Stand with Clock offered are made available by us under item code MEP-84 A & B and are made available in worked height of 5". Featuring best handcrafted finish, these are perfect blend of beauty as well as utility and are made available in quality white marble finish that assists in enhancing its overall finish values. These marble mobile stands can accommodate mobile phones of different sizes and come with floral motifs and other decorations done on its surface.